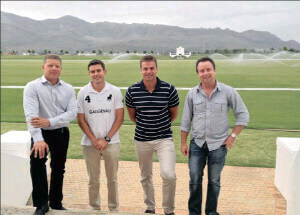 MAIN MEN: At the Val de Vie polo fields and the steps to the clubhouse, Deon Basson (managing director, REDi), Sarel Rossouw (group financial director, Val de Vie), Ryk Neethling ( marketing director, Val de Vie) and Stephen Stiekema (operations director, REDi). VAL DE Vie Estate is all but sold out, with only 25 of the 540 plots still available and a total of 228 homes now completed. However, there is still much to be done on the property and expansion plans or improvements will continue as it evolves, says Val de Vie marketing director Ryk Neethling. “Essentially, the project is sold out, and there are only 20 resale plots on the market at present. But demand is exceeding supply and this is gaining momentum, so we might have to look at expanding our borders at some point,” he says. “The past year has been very successful. In August, the wine cellar and wine farm were sold to a Chinese consortium, which was very well received by management and residents. Last year a total of 130 properties worth just more than R200 million were sold, which included developer plots, houses and resales. Neethling estimates that the value of property here has increased steadily and by 50 percent in the last year on the development plots. “In the last three months of 2013 alone, there were 17 developer plots sold, a vast improvement on previous years. There are also plans to build a boutique hotel and private offices to complement what is already there. Nestled between Paarl and Franschhoek, this is one of the few idyllic places where estate management and developers have carefully thought through what it is that they are striving to create and maintain and what residents have bought into, says Deon Basson, managing director of REDi (Real Estate Development Interactive), whose systems have been implemented to assist with the complete management of the estate, from initial sales to dayto-day operations and communications. “This is predominantly a ‘young’ estate, where most residents are about 40 to 45, many with children under 10,” says Neethling. Apart from co- ordinating the construction of all the homes in various stages of the building process, management of this 220ha estate is a huge operation. Facilities on the estate include 12ha of lakes, which are used for irrigation; the security system, which has thermal camera coverage ( 43 cameras in all) of the 8km perimeter fence as well as day and night visual coverage; the storage units on the estate that have to be managed; the sewage plant that was built specifically for this estate; as well as roads and landscaping, polo fields and stables. REDi’s SiMS (sales information management system) has been implemented to manage, administer and track all sales on the estate, from contract through to transfer of title and, according to Neethling,Val de Vie is finding the use of the interactive sales map an important sales tool. “The REDi community portal (estate management system) has also been put in place to assist with accurate reporting and real-time communication between residents and estate management. “With 900 residents on the estate, the community portal, which can be accessed via any web- enabled device, is an ideal way for everyone to communicate, share community services and access up-to-date information,” says Basson. “All the shareholders who live on the estate and management are working hard to create a fully integrated lifestyle (property), where residents will feel safe and secure and can rest assured that their investments will grow exponentially in the future due to good management,” says Neethling. Call Ryk Neethling on 021 863 6100 or email Ryk.Neethling@valdevie. co.za.